The EL25 is beautifully engineered for private residences, yet powerful and adaptable enough to be used in apartment buildings, condo complexes, office parks and commercial sites. The EL25 is capable of accepting up to 2,000 totally flexible codes. These codes can be programmed as either directory codes or access codes, making the EL25 ideal for virtually any installation. Unlike other systems, the EL25 may be purchased as a base unit or can be ordered with optional plug-in modules. This allows you to choose only the plug-in modules you need depending on the specifics of the job - enabling you to offer custom solutions right off the shelf without special orders. The Crown Jewel is a small, non-obtrusive, self-contained unit that connects directly to your existing phone line, known as a No Phone Bill System. Since the connection is made to your existing phone system, it does not require any additional monthly phone charges. 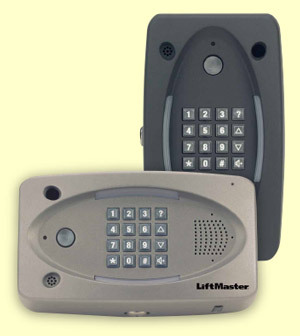 Allows a person to answer a call from the gate or door while in the middle of another outside call. Illuminated keys with help button assistance to audiblyannounce the next key press on the keypad. Locks out all users for a programmable period of time if several invalid code attempts are made. Alarm can be set to activate if the gate or door is held open or forced open. Entry points may be configured to automatically open or lock at set time periods. May be set to automatically dial the residence when a vehicle approaches the property. A minimum of 4,000 transactions are stored in the unit including date, time, unit ID and transaction. Property managers have the ability to print database, system and history reports. 2000 Programmable codes can be time-restricted or established as one-time use only. System updates and upgrades may be made via remote computer over LAN, WAN, or a modem connection. Up to 16 separate holidays can be defined to override the standard lock/unlock schedules. 4 assignable and programmable built-in relays. Timed anti-passback waits for a preprogrammed period of time to elapse before the code or card can be reused. True anti-passback requires use of an exit reader before entering again. Hinge design lets you mount the unit on the back plate for ease of wiring and installation. Landscape or portrait mounting allows for versatility. Up to 62 different time zones with three segments each can be created for access/no access schedules. Provides double ring on the telephone line to distinguish visitor request call. Assignable on a tenant-by-tenant basis, this may be programmed through a touch-tone phone or via a pre-programmed time schedule. Allows each tenant to grant or deny access from a remote location. Feature may be set manually or time-activated to occur automatically. Optional plug-in adaptability lets you expand the EL25 to work with many different types of controls. A two-reader Wiegand module lets you add card readers, keypads and prox readers, all with full activity tracking. An RF module with programmable PassportTM transmitters provides convenient remote access control. An optional color CCTV camera ensures added security. A color low-lux camera compatible with DVRs is also available. A separate lighted paper directory is also available in gray, nickel, silver or black.